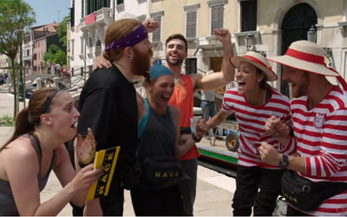 Last week, it was “Viva l'Italia!” for the Amazing Race teams. Well…for six of the seven teams, at least. We saw the spiteful Ashton and her partner ‘Vanck’-uished from the race (I know you saw what I did there…don’t deny it). The oddest of this season’s attempt to create odd couples finally collapsed under the weight of a series of unfortunate legs and were sent home. With that elimination, we are left with really only one heel on this race and if you don’t know who that is, then you haven’t been paying attention. Psst…it’s Brooke. Scott can be a bit grating but I blame Brooke for bringing out the worst in him. Before ripping into the first clue, we see a conversation between Liz & Michael. The burly butcher is reduced to a puddle of tears as he is feeling very homesick and missing his daughter. Liz fills the shoes of the sympathetic teammate and talks him through it and they seem more focused on why they are in this race. Team Fun was number one finally and still unnaturally bubbly. They open the next clue and find out they are going to…I mean…staying in ITALY! The teams will be leaving the home of George Clooney (aka Lake Como) and take a four-hour bus ride north to Venice. It’s not the traditional Race-clumping transportation but close, with three teams on one bus and three teams on another departing 30 minutes later. And with the bus stop literally only walking distance from the pit stop, the order they leave will be the same breakdown on the buses. Becca & Floyd and Matt & Redmond are there first and have a quick conversation that gives a glimpse in the threat that the teams see in Mom/Dad team of Tara & Joey. Becca said the goal is to beat them “to the bottom,” which she says with a little more menace than you’d expect from the captain of Team Fun.